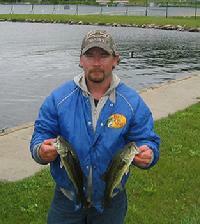 Joining 1st Bassmasters was Rich's first foray into the world of tournament fishing. 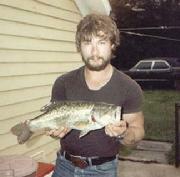 Rich had been fishing all of his life. 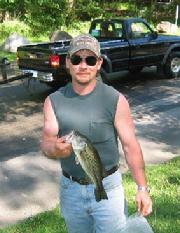 As a child he spent a lot of time fishing & boating on Mohican Lake with his Dad & Grandfather at their summer house. He enjoyed fishing for bass on the Rio Reservoir and Basher Kill from his Coleman row boat, and fished Swinging Bridge from his Tracker . 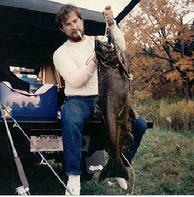 Rich also loved to target both Trout & Bass on the Delaware River & Roundout Reservoir, and as you can tell from the photo, he had tried his hand at Salmon fishing with positive results. Rich was also an avid Deer & Turkey hunter. In 2004 Rich doubled his Rookie year totals, and fished with the club’s 6 Man State Team on Cayuga Lake as an alternate, weighing in the 3rd highest total for the team with 14.47lbs. 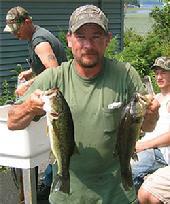 On July 17th 2005, Rich took 1st place on Lake Champlain while fishing a NYS BASS Chapter Federation Points event. 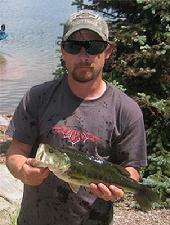 His winning total of 16lbs 8ozs included a 5lb Largemouth. Additionally, he managed this impressive win as a non-boater. 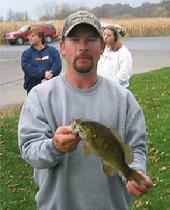 On October 23rd 2005 Rich fished his last event with the Club, winning our season finale on the Hudson. He passed away the following Spring. 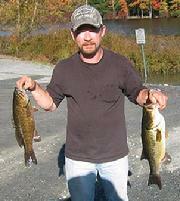 In Rich's honor, 1st Bassmasters has permanently placed our October Open Tournament on the Hudson river.